Senator Edward McGuire, Newtown Park House, Newtown Park, Co. Dublin. Anon. sale, Christie's, London, 21 March 1969, lot 80 (800 gns. to Fletcher). The present picture would appear stylistically to pre-date Barret's move to London in 1763. 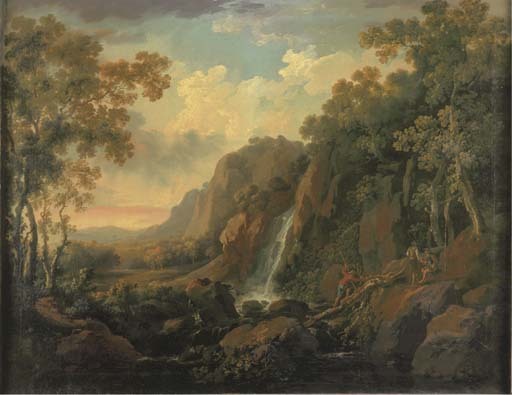 The dramatic composition was no doubt inspired by the scenery which Barret had seen and painted in the Powerscourt demesne, Co. Wicklow, for Lord Powerscourt. The composition also shows the influence which James Burke's ideas on the sublime had on the artist. Senator Edward McGuire bought Newtown Park, Blackrock, Co. Dublin, in 1946 and formed a notable collection 17th and 18th Century paintings. In 1976 the house was sold and Christie's, in conjunction with Hamilton & Hamilton Ltd., held a sale of the contents of the house on 20-22 September that year.